OVD dark rum is blended from the very finest demerara rums in the world, matured in oak casks, giving OVD its smoothness, flavour and character. OVD is highly versatile and can be drunk long or short, for a warming effect on a cool day, or a cooling effect on a hot day. It can be taken with all popular mixers or simply on its own. Slightly sweeter than most dark rums, OVD has a distinctive oaky aroma that comes from the blending of some of the finest Demarera rums that have matured for up to seven years in oak. OVD is creamy rum, with complex toffee flavours, rich and fruity on the palate and with a mellow finish. OVD can be drunk neat, on the rocks or as a mixer drink. Drink it with ginger, cola or fresh orange juice. Also popular with peppermint cordial or blackcurrant. This is an absolute steal at the price, not as spicy as Black Seal, not as fierce as Woods, smoother than Pusser\'s and rich full bodied and warming. Compared to standard Navy rums like Lamb\'s it tastes richer and smoother. All I\'ve ever added to it is a little water and it is an ever present in my golf bag hip flask. My playing partners can\'t wait till the ninth hole for a nip against the cold! Being Scottish this drink is a home from home for me. 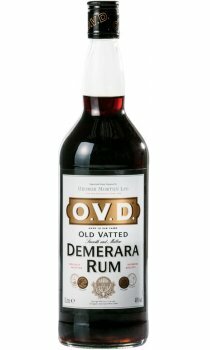 I have been drinking OVD for the past 20 years and have never found another rum that can match it. Glad I have now found a supplier of it in England. I've drank this before and find it an average mixing rum and there are much better out there in the same price range.